Josh Black is the perfect little carrier for classic black lovers. It has a blue highlight, just the right accent to brighten it up. Please note that only i-Angel purchased in Indonesia and imported by BalitaKita will be covered by factory warranty. Apakah bayi anda hanya ingin digendong hadap keluar tetapi sudah terlalu berat untuk digendong dengan tangan dan andapun khawatir mengenai posisi yang terlalu lebar saat digendongan? i-Angel adalah jawaban yang aman dan nyaman bagi si kecil dan orang tua. Dengan model Hip Seat pertama di dunia, dengan gendongan i-Angel si kecil dapat menghadap keluar saat digendong tanpa resiko sakit atau posisi yang salah. Orang tua pun dapat menggendong tanpa berat berlebih pada satu titik yang mengakibatkan sakit badan. Dari bayi 0-3 tahun atau 0-20Kg. i-Angel is the first hip seat carrier in the world and is the best baby carrier out there! i-Angel is made of high grade cotton and polyester for the body of the carrier. The luxurious compressed Styrofoam seat is designed to be safe and comfortable for the baby. It is also hand washable so it makes it easy to clean and maintain. Its innovative and ground-breaking hip seat design allows baby to sit comfortably in an upright position and supported all the way to the knees whilst being carried by the parents. The baby is safe and comfortable with no hips or leg strains from crotch dangling. i-Angel is good for parents too! Wide waistband and shoulder straps enables great weight distribution on. 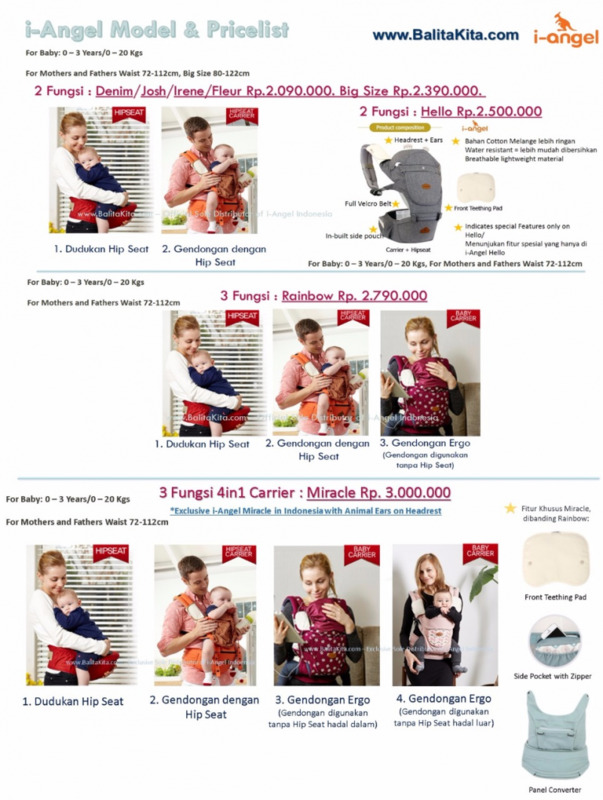 So parents can carry their baby while keeping their hands free to do other activities like shop, travel, clean, and with no back-ache or shoulder-ache experience afterwards. i-Angel is designed to last for a long time. It is suitable for babies weighing from 0–20 kgs or those from 0-3 years old. The waist band is suitable for 72cm - 112cm so everyone can hug your baby close. A smart investment choice for great parenting experience.